Talking about email marketing can be a bit like talking about socialism or politics. Everyone has own opinions and that too a very strong one about what will or won’t work out. Time is everything, Right? But in case of Email Marketing, we can say it’s everything but yes it is something that certainly matters for your email open rates. We should avoid sending emails on Mondays because your customers can be too busy, and should try to avoid Fridays because everyone start remaining in flow of weekend. We should avoid sending emails on weekdays, or after 5 pm, because people probably ain’t able to access their computers. In fact, it can be said that the best time to send an email is on Lucky Tuesday probably at 10:15 am. This is quite obvious, it’s always good to send out your emails at the daytime. Obviously because people are awake and not asleep. After all why to disturb others is sake of that you have launch just a campaign. Weekends can result in low open rates because historically weekend are meant to relax and to plan out for a break. So you have very less probability that your emails would be checked if you delivered it in weekend. It would be quite good if you drop out the plan to throw your campaign on Monday. The general reason behind it is people are already in enough frustration about the end of the weekend. What will actually happen is they reach their office and found themselves flooded with emails which they’ve collected over the past two days. Do you know, what’s the first thing they will do? Delete those complete sac of emails of course! Tuesday, Wednesday, and Thursday is proved to be the favorite days to send emails, MailChimp confirms that Tuesday and Thursday are the two most popular days to send email newsletters. The best approach to send an email campaign is middle of the week and in the that too in middle of the day. Sending emails between 1-3 pm and 9-11 am is advisable. MailChimp suggests 2 pm as the best send time based on their data. # Is It Really So?? So almost everyone commits that Tuesday, Wednesday, and Thursday are the best days to shoot out your email campaigns. But these would remain your best says unless your email competitors lives on the North Antarctica, even they have heard about this advice as well which means that you will be facing an unbearable competition by throwing out your emails on the advisable day and times. If you seriously want your email to stand up on the hustle, and don’t want it to find it swimming over the emails than go for your own time and your own day. Although Mondays and Fridays are not recommended, but even though who can say they won’t work for you? Know how your timing can depend on various factors. As per the Brafton studies, 55% of consumers open emails on desktops, while only 25% open emails on mobile devices. So it can be said that best time to send your email are can also depends on the habit of your users as habits changes across devices. The mid-week, mid-day can be perfect for desktop users who open their emails during work. We can notice that Mobile users can be found active even late in the night. Discovering your right time i accordance to you and your services is the single most important thing you can do for success of your email marketing. They’re your customers and you have to discover their habits. If you have more youngsters as your customer that is tech friendly clients then you can ignore the most common tip of not sending emails at night as evening emails can work for you more efficiently. So, always remember to consider your target audience’s time comfortability. The simple and correct answer for “what is the best time to send an email campaign?” is there is no such appropriate time to send an email, it just depends on your audience, that’s it!. I know it’s harsh but it’s true. While there are a lot suggestion and advices can be heard from different Email Marketers but here you can see that how we can make those advices useless for your services. You must me thinking, common!! I am here for an answer and not for a statement or a subjective truth. To which I can say, the mid-day, mid-week idea is a great way to give a start up. However, if you really want to achieve success in email marketing and want more opens, you need to do a TEST! 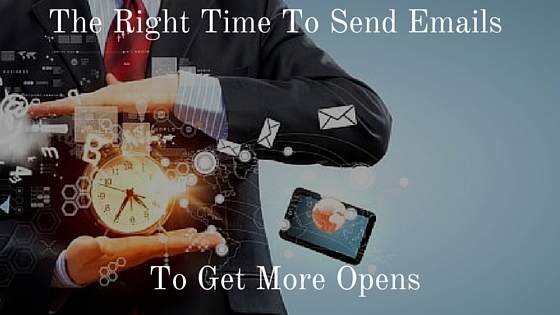 Related Post : 10 Amazing Tips to Increase Your Email Open Rates!